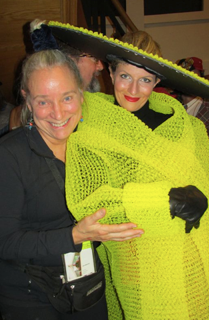 Thanks to Vera Struck, creator of the Silver Bullet Tiny House, who designed a coat made entirely out of Slicker Classic to benefit the sustainability of the non-profit, Long Way Home. Long Way Home is a non-profit that uses sustainable design and available materials to build self-sufficient schools that promote education, employment and environmental stewardship. Every year they host Rubbish to Runway, a yearly fundraiser in the Newburyport, MA area that promotes the reuse of materials in the construction of fashion fit for the runway. Last year they had 28 walks on the runway of fashions made of re-purposed, recycled and reclaimed materials. The funds from last year’s show went to build a cafeteria for the students of the Tecnico Chixot Educational Complex in San Juan Comalapa, Guatemala. We are proud that Slicker Classic could be used to support such a great cause! Thank you Vera for supporting our products and involving us in such a unique experience! If you would like to see Slicker Classic walk the runway please watch the Rubbish to Runway video beginning at minute 19:02. For more information about Vera Struck, please check out her website information below.